That’s a whole heaping bag of fail right there. 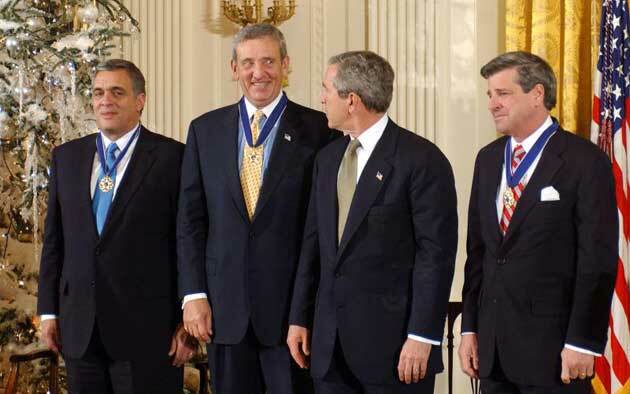 From left to right, we have the guy who screwed up the intelligence before the Iraq War (George Tenet), the guy who screwed up the troop numbers for the Iraq War (Gen. Tommy Franks), the Decider himself, and the guy who screwed up the Iraq occupation (L. Paul Bremer). Later, Gen. Peter Pace, noted homophobe, also got himself a shiny medal. The current president has slightly different criteria for awarding this prestigious honor. His list includes Stephen Hawking, Billie Jean King, Sidney Poitier, two Nobel Peace Prize winners, and (tear) Harvey Milk, among others. It really makes that parade of fail above look especially pathetic. It’s a small thing, but it is, for once, some real change.